Play-off chasing Middlesbrough held on to beat struggling Reading and raise the pressure on Royals boss Jaap Stam. Adama Traore put the hosts ahead when he cut inside from the right and fired past Vito Mannone with his left foot. Traore's powerful strike doubled the lead, but Chris Martin's shot pulled a goal back for Reading after the break. 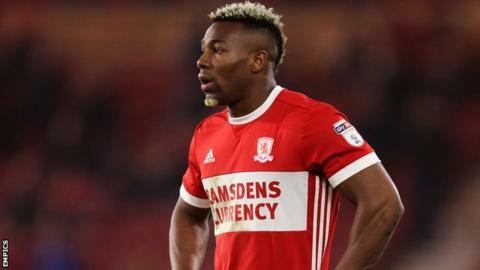 Middlesbrough could have won by more, but Britt Assombalonga lifted a late penalty high and wide after Traore had been tripped by Dave Edwards. Reading have now won only once in their past 11 league games, leaving last season's play-off finalists only four points above the relegation zone. Martin's goal was his first since joining the club on loan from Derby on transfer deadline day, but it was one of only two shots on target for Stam's side. Middlesbrough closed to within four points of the play-off places, extending their division-best record of 14 successive wins in games when they have scored first. The result also saw the hosts claim a third consecutive victory against Reading for the first time in the club's history, while it was only the second win in nine attempts against the Royals for boss Tony Pulis. "We were desperate to take that monkey off our backs. We have played well in most games this year apart from taking chances in the final third. "We missed a penalty, Patrick Bamford missed from six yards and Grant hit the inside of the post. We could easily have had four or five goals. "Two-nil is always a tough scoreline as if the team you are playing against get one goal it gives them a lift psychologically. "There is a quarter of a season to go and no-one is talking about us. There's no pressure on us." "If you see how we conceded the two goals, by giving them away, it makes it hard to get back in the game. "They played in a very physical way in the first half and it was not easy to defend at times. "Chris gave us a certain belief to go forward but we had to be careful of them on the break. We could have got more out of it but unfortunately we didn't. "Everybody finds the run frustrating and hard to take. The players are working hard but when you have the ball you have to attack and keep taking the initiative." Offside, Reading. Chris Gunter tries a through ball, but David Edwards is caught offside. Offside, Middlesbrough. Adama Traoré tries a through ball, but Britt Assombalonga is caught offside. Corner, Middlesbrough. Conceded by Tiago Ilori. Attempt blocked. Britt Assombalonga (Middlesbrough) right footed shot from the left side of the box is blocked. Assisted by Jonny Howson. Substitution, Middlesbrough. Martin Cranie replaces Stewart Downing. Attempt blocked. Sone Aluko (Reading) left footed shot from outside the box is blocked. Assisted by Pelle Clement. Adam Clayton (Middlesbrough) is shown the yellow card. Leandro Bacuna (Reading) is shown the yellow card. Offside, Middlesbrough. Grant Leadbitter tries a through ball, but Adama Traoré is caught offside. Penalty missed! Bad penalty by Britt Assombalonga (Middlesbrough) right footed shot is too high. Britt Assombalonga should be disappointed. Penalty conceded by David Edwards (Reading) after a foul in the penalty area. Penalty Middlesbrough. Adama Traoré draws a foul in the penalty area. Corner, Reading. Conceded by Ben Gibson. Attempt blocked. Chris Martin (Reading) right footed shot from outside the box is blocked. Assisted by Sone Aluko. Substitution, Middlesbrough. Britt Assombalonga replaces Rudy Gestede. Goal! Middlesbrough 2, Reading 1. Chris Martin (Reading) left footed shot from outside the box to the bottom right corner. Assisted by Pelle Clement following a corner. Corner, Reading. Conceded by Ryan Shotton. Attempt blocked. Yann Kermorgant (Reading) right footed shot from the centre of the box is blocked. Assisted by Chris Gunter. Rudy Gestede (Middlesbrough) wins a free kick in the attacking half. Attempt missed. Leandro Bacuna (Reading) left footed shot from outside the box is high and wide to the left following a corner. Substitution, Reading. Yann Kermorgant replaces Garath McCleary. Corner, Reading. Conceded by Jonny Howson. Corner, Reading. Conceded by George Friend.